MELBOURNE, Australia — Robert Whittaker may get another title fight in Australia despite the middleweight champion having to withdraw from Sunday’s UFC 234 event, UFC president Dana White says. Whittaker, 28, made weight for his bout against American Kelvin Gastelum before pulling out at the 11th hour with a “potentially fatal” abdominal hernia. He was rushed to hospital for emergency surgery, leaving fight fans stunned and forcing organisers to cancel the main event and reshuffle the card. It’s the second time Whittaker hasn’t taken to the Octagon for a title defence on home soil. In February last year he suffered serious infection as well as a bout of chickenpox ahead of his fight against Luke Rockhold at UFC 221 and subsequently pulled out. UFC 234 didn’t quite go to plan with Australian champion Robert Whittaker forced to withdraw from his bout, but the atmosphere in Melbourne proved just how popular the sport has become Down Under. While White admits there are no immediate plans for the UFC to return to Australia, he says there’s no reason another title fight can’t take place Down Under later in 2019. “We have most of this year laid out already and I don’t think one of those is to come back to Australia with a title fight,” White said. “But who knows? Maybe we add Australia again and try Rob again for a third time here. 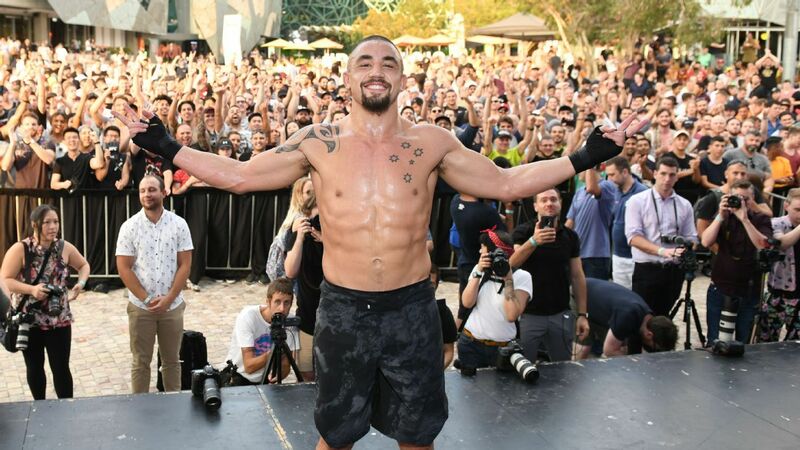 Whittaker is expected to be out of action for around four to six weeks as he recovers from his surgery and although there’s no fight plan currently in place, White has ruled out the possibility of him being stripped of his belt. “His colon and his intestine popped through his stomach. I think we can give him a pass for not showing up to work,” White said of Whittaker. “Let’s see how long it takes him to recover from this and we’ll make something as fast as we can. “When we have a guy who blows an ACL or wants to take time off, we look at how long a guy is going to be off and whether the other guys should have to wait. Time is not your friend in this business and when one guy decides to take time it’s not fair to everyone else who is grinding and fighting.